Vermont has no South Indian restaurants, save for Brattleboro food truck Dosa Kitchen. So this weekend, I headed across the border for an overdue megadose of fiery flavors at Thanjai Restaurant in Montréal. The owners of the 2-year-old restaurant, Geetha Kumaresan and her husband, Kumaresan Muthukrishnan, bill Thanjai as Montréal's first authentic South Indian restaurant. What's the difference between the kormas and masalas many of us are familiar with and food from Kerala, Tamil Nadu and Andra Pradesh? The southern states stay cool by avoiding creamy sauces and amping up the heat. Think of it as a leaner, meaner Indian food. I grew up eating a few South Indian dishes served at buffets in my native NYC suburbs. 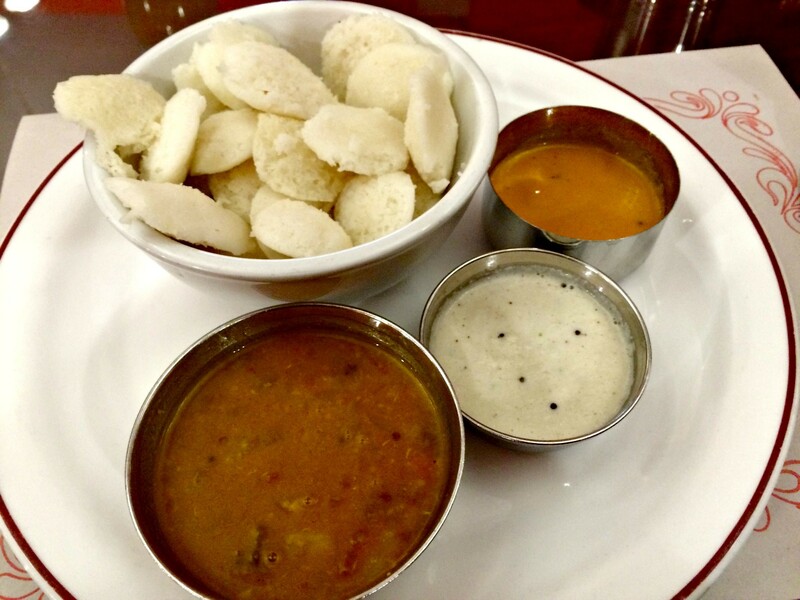 One of my favorites has always been idli. The fluffy little rice cakes go down easily, which makes sense for a food usually served at breakfast. Thanjai's dollar idli ($5.50) shrank the small disks of fermented rice and lentil flour to oyster-cracker proportions. The batter was less sour than I prefer (I usually compare it to the sharp sourdough flavor of Ethiopian injera), but it hardly mattered when dipped in their accompanying chutneys. The spiciest was in the largest cup shown above. That's sambar, a lentil stew filled with soft veggies and made compellingly sweet and sour with the addition of tamarind. At first bite, creamy tomato chutney and a clumpy coconut chutney seemed dull by comparison. But the more I ate, the more their spices bloomed, making them more addictive with each bite. The same sauces accompanied each of the more than 50 different dosas served at Thanjai. That includes a six-footer —meant to feed six to 10 people — that gets regular play on televisions placed throughout the restaurant. The rest of the time, the TVs show stylishly photographed images of the various foods on the menu. For western newbies, this is a godsend. My other half ordered entirely based on what he saw on the screen. 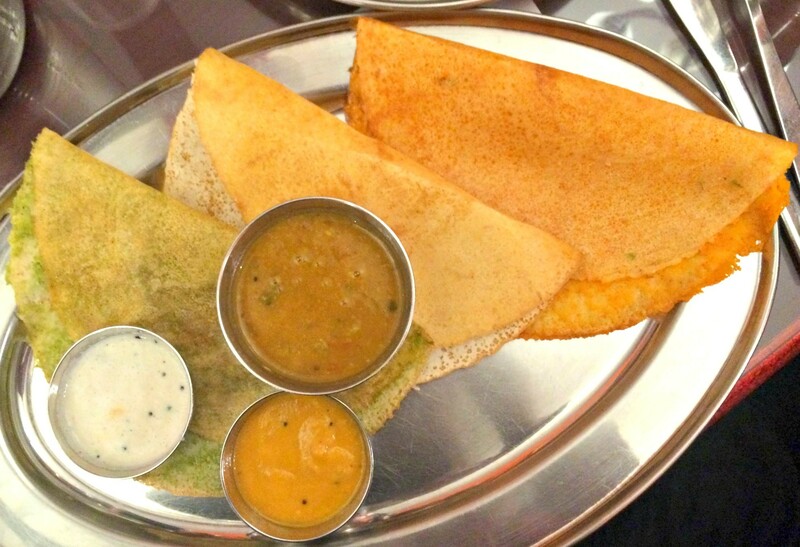 Like idli, dosa are made with a fermented batter of rice and lentils. Unlike idli, the bigger pancakes are prepared from batter spread on a griddle so thin that they make crêpes look fat. 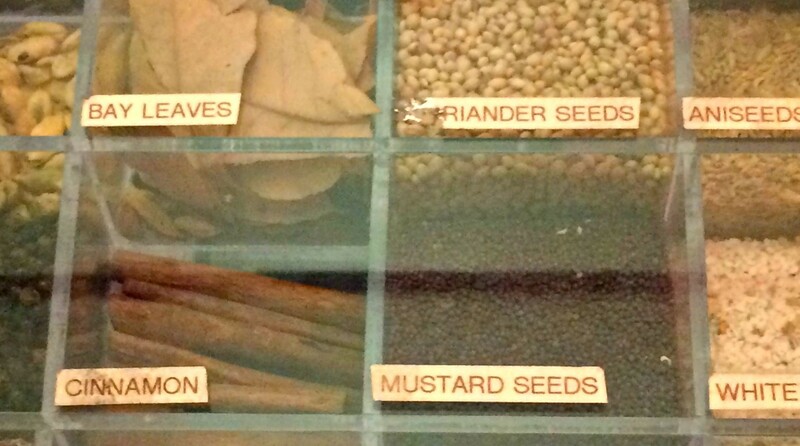 With a headache-inducing variety of fillings, it wasn't easy to choose. Should it be the Kanchipuram kara dosa, filled with blisteringly hot chiles, cabbage and pepper? Or go conservative with cheese and garlic? I decided to take the patriotic route with the Indian flag dosa ($8.95). Arranged with orange on top, followed by white and green as promised, the tryptic of mini dosas turned out to be an elegant choice. The saffron color of the top dosa indeed came from the precious spice, lending a rich, aromatic taste to the crisp pancake. The white center was a plain dosa, which I dispatched first, drowning it in sambar. But my favorite was the green one, rubbed in cilantro paste for a bright, springy contrast to the spicy dips. I have both an academic and sensual interest in fusion foods, so the rise of Indo-Chinese cuisine has been significant to me. 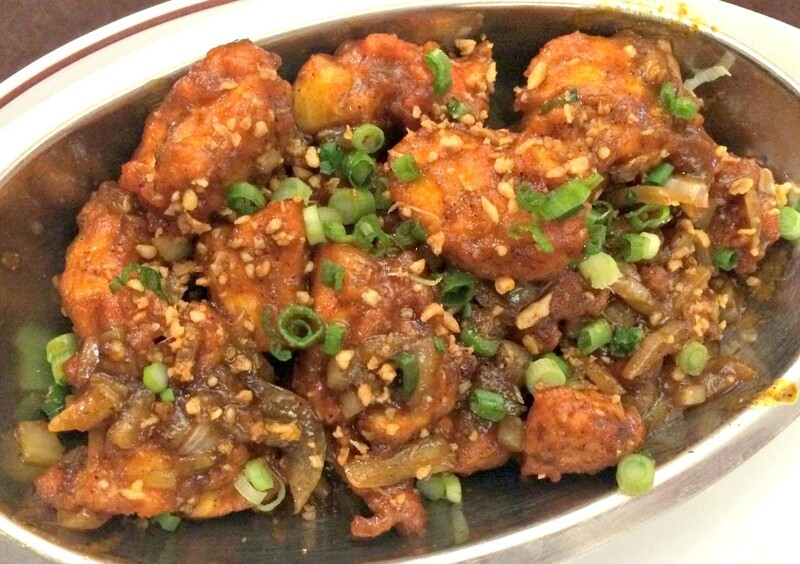 When blessed with the opportunity, I always order a dish like Thanjai's Chili Chicken ($9.95). It may look like our General Tso, but those meaty little chunks of deep-fried chicken were actually spicy. Rather than the sickly sweetness we expect from Americanized Chinese food, Indo Chinese is fresh, with lots of chiles mixed with sautéed onions and a shower of scallions. 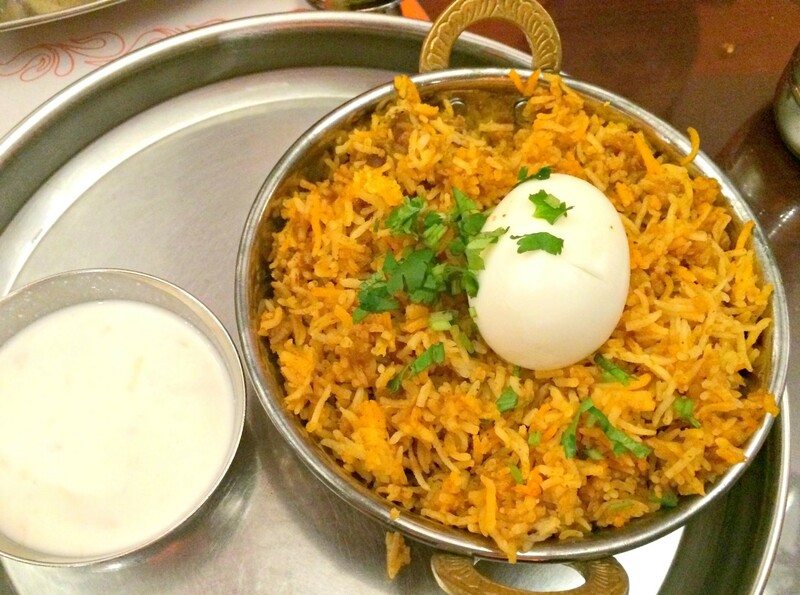 Every Indian food fan knows the biryani well. But Thanjai's lusty lamb version ($12.50) was one of the best I've had. Cooked tender in lamb stock, the rice took on a rich meatiness that held its own amid a heavy dose of spice. Big cubes of surprisingly lean lamb fell apart easily once lifted onto my plate with the rice. A tangy yogurt chutney filled with pickled veggies provided relief when the spices muddied my palate. Our server, who seemed concerned about our ability to handle the meal from the beginning, was nonplussed when I pressed about dessert options. At first, he told us he would only recommend that we try gulab jamun or kheer. I eventually wrestled out of him that the South Indian sweets I craved were available. Apparently our demolition of a table full of three-chile-labeled savory dishes didn't convince him we could stomach a piece of milk burfi. 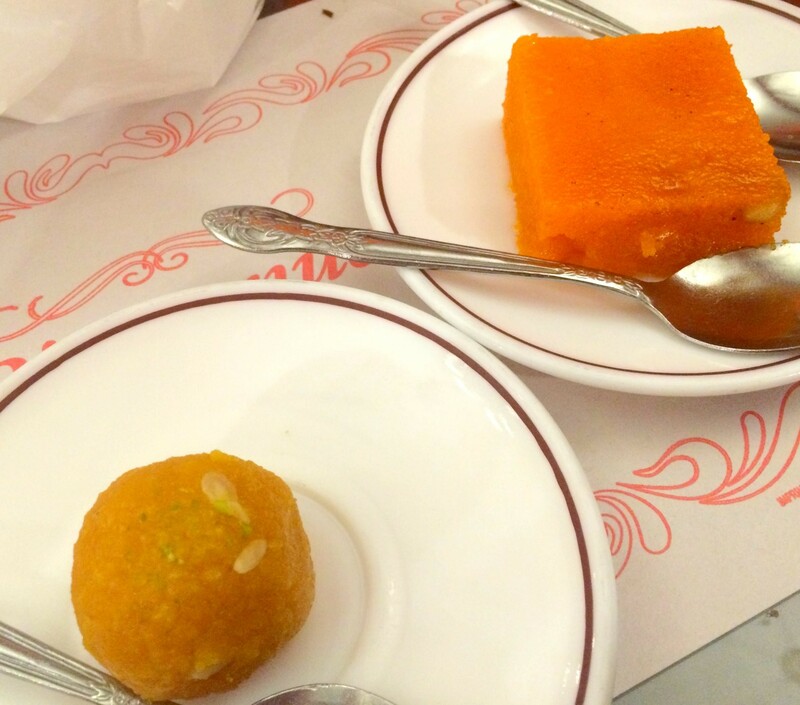 I skipped that candy, which I'd OD'ed on during a trip to Edison, N.J., earlier this year, in favor of a single laddu ($1.50), a crumbly ball of sweet chickpea flour; and a petite square of gajar halva ($3). Made from carrots bolstered with semolina flour, the warm pudding was creamy with coconut and less painfully sweet than it often is. I was impressed with everything I tried at Thanjai, but the halva might be the only thing I would order next time I dine there. There are too many appealing options to dare repeating — unless it's a perfect version of a special sweet.